The sun breaks through the highest mountainpeaks, the clouds slowly parted by the wind to reveal a marvel of human ingenuity, Highthrone, a grand city clinging to the cliffs and mountain slopes, teeming with people who got used to living - even thriving - at heights reserved for the proudest and strongest birds, dragons and spirits. Highthrone is a city of contrasts, to all appearances a noble and successful city of proud resourceful people who have weathered all that the extremes of mountain life can throw at them. Appearances can be deceiving however, for beneaththe surface lies a rich mixture of political turmoil and approaching conflict. * Highthrone - An Overview: Highthrone stands miles above sea level, ensconced in a treacherous mountain range, and yet its inhabitants prosper, discover the history of how such a secluded spot came to be the site of so unique a city. * Lay of the City: From religion, to festivals, to the cornerstones of Highthrone's political structure, the city is a diverse mix of culture and climate. * Valley of the Crowns: The principal area of the city contains the estates of the Old families, temples, businesses and of course the skyship ports. * The Terraces: Agriculture and trade craft, carved into the living rock, most of the inhabitants now live and work on the edge of the mountain. * The Mines and the Floating Islands: Above and below, from the windsteel mines that allow the skyships to sail, to the greatest use of it to date, islands ripped from the mountainside to float above the city. * Factions and Players: An introduction to the politics, individuals and groups that plot and scheme within the city. 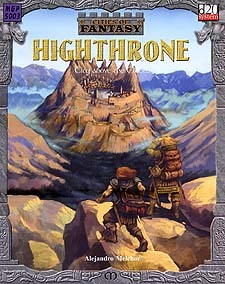 * Running Highthrone Adventures: Suggestions on how to introduce Highthrone into your campiagn, and what to do with it when you do so, including details on the city's legendary skyships. * Creatures of the Peaks: From the Peaks ram to the dread wind raptor, the creatures of the city are uniquely adapted to their surrounds. * Magic and Secrets: The secrets of windsteel, and feats designed for those who dwell above the clouds. This product requries the use of the Dungeons and Dragons Player's Handbook, Third Edition.